What are the biggest drawbacks of driving an electric car today? Elon Musk has solutions. In an event Tesla and SpaceX CEO, Elon Musk described as being just as important as the SpaceX ISS cargo mission this summer, he unveiled his plans to solve practical problems of electric vehicle ownership with a new network of charging stations. He revealed six stations are already in place as of today that let you drive from Lake Tahoe to San Francisco to Los Angeles and then on to Las Vegas opening up a sizable portion of California and Nevada to people wishing to take their Teslas a little further than the corner grocery store. Within two years Musk says Tesla plans to have installed a network that goes from coast to coast, making a cross country trip in an electric car a practical reality. The superchargers will give their 85 kWh battery a 150 mile range in 30 minutes. While that’s a bit longer wait than at the gas pump, the charging is free to all Tesla Model S owners. Buying a car that gets free energy for life is a radical, game changing idea – the kind of thing Musk has become known for. 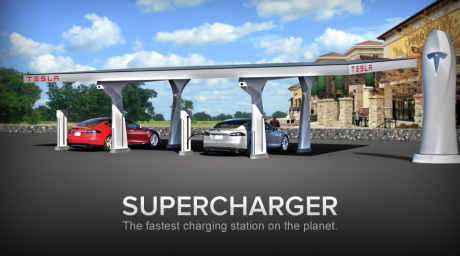 The charging stations will be covered in solar panels (provided by Musk’s other company, Solar City) and put power back into the grid when not charging up the Superchargers. The revelation of the Superchargers gives us some insight into Musk’s grander vision for Tesla. It’s not just a company that makes electric cars, it’s a transportation system. He could be well on his way to changing the electric car the way Apple did the phone. Without an internal combustion engine or transmission tunnel, the interior of Model S has more cargo space than any other sedan in its class and includes a second trunk under the hood. Model S seats five adults and two children in optional rear-facing child seats. Model S Performance models accelerate from 0 to 60 mph in under 4.4 seconds. The interior features a 17″ in-dash touchscreen with internet capabilities, allowing for streaming radio, web browsing and navigation. You are currently browsing the archives for the Tesla category.